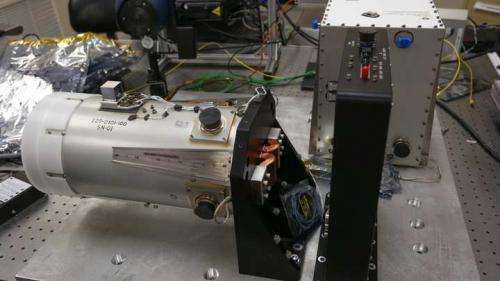 An expanded view of lightning around the globe is coming closer for scientists at The University of Alabama in Huntsville (UAH), thanks to a repurposed measuring instrument. UAH researchers have passed NASA qualifying inspections and shipped out a Lightning Imaging Sensor (LIS) in preparation for its planned March 2016 flight to the International Space Station (ISS). The instrument, dubbed ISS LIS, was originally built as a flight spare for a LIS mission that launched in November 1997 aboard NASA's Tropical Rainfall Measuring Mission (TRMM). That instrument is still in operation today. Like the LIS that flew before it, the current ISS LIS is a space-based instrument used to detect the distribution and variability of total cloud-to-cloud, intracloud and cloud-to-ground lightning that occurs in the tropical regions of the globe. Funded by NASA, ISS LIS is being shipped to the Johnson Space Center (JSC) in Houston, Texas, where it will be integrated onto the Space Test Program H5 spacecraft as one of 10 instruments. The integrated H5 spacecraft will then undergo environmental testing at JSC through August of 2015. The H5 will then be shipped to NASA Kennedy Space Center for integration onto the EXpedite the PRocessing of Experiments to Space Station (EXPRESS) Pallet Adapter (ExPA). The ExPA will in turn be attached to a SpaceX Dragon Capsule for the 2016 launch. "The ISS LIS will be integrated onto the Space Test Program H5 spacecraft at NASA's Johnson Space Center in Houston, where it will undergo testing through August 2015," says Mike Stewart, a UAH Earth Systems Science Center (ESSC) principal research engineer. "The ISS LIS will be one of 10 instruments on the H5." Once on-orbit, the ExPA will be robotically mounted to the EXPRESS Logistics Carrier (ELC), which provides the payload interface to the ISS. The ELC will be attached to the ISS truss structure. In less than 16 months, UAH's ESSC and Rotorcraft Systems Engineering and Simulation Center (RSESC) designed, manufactured and space-qualified a new Interface Unit to adapt the legacy TRMM/LIS Electronics Unit and Sensor Unit to the STP H5 spacecraft. The legacy TRMM/LIS Units also required adaptations for the STP H5. "This development is an excellent follow-on to the original LIS, extending our ability to observe global lightning activity over a longer period of time," says Dr. Hugh Christian, a principal researcher at ESSC and the principal investigator for the ISS LIS instrument. "Further, ISS LIS will be in a higher orbital plane, thus extending our observations to higher latitudes." ISS LIS is designed to detect lightning during the daytime and nighttime. It takes 560 images per second and transforms those images into lightning events using specialized electronic processors. ISS LIS will be launched at about the same time as the Geostationary Lightning Mapper (GLM), much of which was also designed and developed at UAH. It will provide important validation data for GLM. In addition, there will be important complimentary instruments on the space station that will enable researchers to significantly extend knowledge of Terrestrial Gamma ray Flashes (TGF). "We hope to continue our studies of lightning and severe weather, investigate the relationship between global lightning activity and climate change, provide validation for the GLM, and improve our understanding of TGFs," says Dr. Christian. UAH's ESSC was the ISS LIS technical and scientific lead. The university's RSESC was the program manager and lead systems engineer. "RSESC supported ESSC by providing the engineering and program management to complete the project," says Sue O'Brien, principal research engineer at RSESC. "UAH worked with NASA's Marshall Space Flight Center and provided the information and analysis to complete the certification and associated processes," O'Brien says. "We prepared this payload for flight and are ready for delivery to NASA's Space Test Program in just over a year, which was quite an accomplishment for the team," O'Brien says. "We are looking forward to the knowledge gained from ISS LIS and what UAH can accomplish in space in the years to come." ISS LIS carries forward a long UAH pedigree in space-based lightning research, Dr. Christian says. "I started working on the concept of space-based lightning observations in 1980," he says. "Our first instrument, the Optical Transient Detector (OTD) was launch in April 1995."